England enjoyed an overall lead of five runs with four wickets in hand against Pakistan as the bowlers from both sides dominated the game by grabbing 16 wickets on the first day of the third Test. Pakistani batsmen struggled early in the day and could manage just 99 runs before they were bowled out in their first innings. England batsmen did not enjoy either but scored 104 runs for the loss of six wickets at the close of the first day’s play. The third and final Test of the series is being held at Dubai International Cricket Stadium from February 3, 2012. Earlier, the Pakistani Captain, Misbah-Ul-Haq, won the toss and opted to bat first but his decision was let down by their openers as Taufeeq Umar was declared leg before wicket off James Anderson for naught in the very first over. The quickies duo of England consisting Anderson and Stuart Broad took over instantly and the Pakistani batsmen found it hard to negotiate with their lethal bowling. They had lost their top five batsmen for mere 21 runs and were heading towards their lowest ever score in Test cricket. They were humiliated by Australia for just 59 runs at Sharjah in October 2002. The seventh wicket was lost at 44 runs and they were inching towards their lowest total when young Asad Shafiq held his nerves and added 34 runs with Saeed Ajmal. Asad was the ninth batsman who was dismissed after scoring 45 runs as the whole team was sent back to the pavilion for 99 runs. Broad broke the back of their top order while clinching four wickets, Anderson held three, Monty Panesar two and Graeme Swann claimed one wicket. England was sent back to their shells by the rival fast bowler Umar Gul when he claimed the first two wickets at the total of mere seven runs and made the game open. Captain Andrew Strauss and Kevin Pietersen put their heads down and consolidated the innings by contributing 57 runs for the third wicket. The later was gone when he was declared lbw off Abdur Rehman even after it was referred to the third umpire. 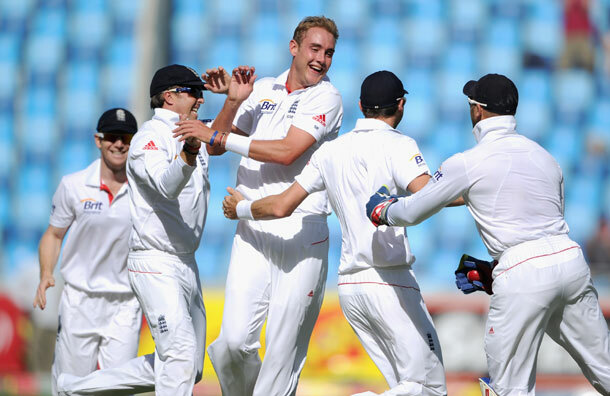 England went back to their defensive approach when the Pakistani spinners invaded them once again in the series. Ian Bell was stumped by the wicket keeper Adnan Akmal off Saeed Ajmal which went upstairs and red signal was awarded to the batsmen. The concerned form of Bell continued in the series as he was able to add just five runs to his credit. Strauss was wondering at one end as the wickets were tumbling at the other side when Eoin Morgan came in to bat. He dispatched six on the first ball of the 33rd over from Ajmal but his innings was shattered by Rehman in the very next over for 10 runs. Matt Prior was bowled by a beauty from Rehman on the last ball of the 38th over for six runs. Anderson came in next and survived 18 balls after scoring three runs as Strauss secured his end by unbeaten 41 runs off 120 balls with the help of 4 fours. England surpassed the first innings total of Pakistan and had scored 104 runs for the loss of six wickets in 43 overs. They will try hard to earn a reasonable first innings lead which can enable them to win the first match of the series. Pakistan will try to fold their innings as quickly as possible and their batsmen should play determined innings to come back in the match.